Discussion in 'Economics & Trade' started by US Conservative, Nov 2, 2018. The unemployment rate stayed at 3.7 percent, the lowest since December 1969. Job growth blew past expectations in October and year-over-year wage gains jumped past 3 percent for the first time since the Great Recession, the Labor Department reported Friday. Nonfarm payrolls powered up by 250,000 for the month, well ahead of Refinitiv estimates of 190,000. The unemployment rate stayed at 3.7 percent, the lowest since December 1969. The ranks of the employed rose to a fresh record 156.6 million and the employment-to-population ratio increased to 60.6 percent, the highest level since December 2008, according to the department's household survey. That headline jobless number stayed level even amid a two-tenths of a percentage point rise in the labor force participation rate to 62.9 percent. Those counted as outside the labor force tumbled by 487,000 to 95.9 million. But the bigger story may be wage growth, which has been the missing piece of the economic recovery. Average hourly earnings increased by 5 cents an hour for the month and 83 cents year over year, representing a 3.1 percent gain. The annual increase in wages was the best since 2009. This is outstanding news, particularly heading into the holiday season. The Trump economy is booming. struth, Ddyad, Talon and 7 others like this. The choice is simple, More of this amazing Trump Economy or go back to Bush/Obama Stagnation? Ddyad, US Conservative and TheGreatSatan like this. Democrats called it managed decline. The new normal. They all said this economy was impossible. 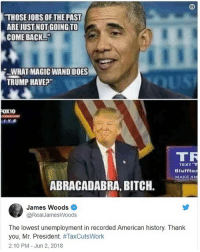 Trump would need a magic wand to do what he did. Ddyad and Zorro like this. Finally an article that states the real unemployment rate. "A broader measure of unemployment, which includes people who want to work but have given up searching and those working part-time because they cannot find full-time employment, is 7.4%." looking at this graph its obvious, the unemployment rate start decline since 2010, and the slope is same under Obama or trump. meaning it has nothing to do with president but everything to do with economy recovery as the norm. ronv, Cubed and Quantum Nerd like this. Ddyad, ButterBalls and TheGreatSatan like this. Gosh I wonder if this is relevant going into the midterms? Ddyad, jwmac, ButterBalls and 1 other person like this. The only good economics that happened during Obama was because of the fracking boom which he tried to stop. Ddyad, US Conservative and ButterBalls like this. fracking doesn't contribute that much economy during that time. Trump's Job Creation is 26% stronger than Obama-The-Unfortunate's. And with the best wage growth in nearly a decade, likely explains why Trump is so popular right before the Midterms! jwmac and US Conservative like this. Still not tired of the winning. Ya I keep hearing that from the left and none yet have successfully explains how any of that was corrected from his economic policy. Trump and the GOP Congress continue to keep making America great again! Ddyad, ButterBalls, myview and 1 other person like this. And he had the benefit of 0% interest rates. Ddyad, ButterBalls, US Conservative and 1 other person like this. Nancy Pelosi would tell you then you would have more time to work on arts and crafts and things. That's how they responded to people's hours being cut because of obamma care. It would be 65% if not for the attempted Deep State coup/Mueller probe and fake news MSM. Hotdogr, ButterBalls and TheGreatSatan like this. No it didn't, just as I gambled on That's always the leftist go to, but reality and history show that money went in to financial institutions and never came back out..
Actually Trump has not only doubled GDP growth and got us the best wage gains in nearly a decade, but in an amazing triple, he has also slowed the growth in the Federal Debt. He's been President for 651 days and the debt has grown $40,185,139,295.90 LESS than it did over Obama's final 651 days. struth and Robert like this.